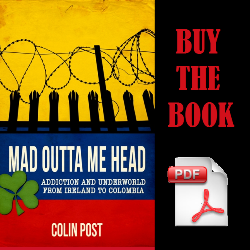 This is an excerpt from Mad Outta Me Head: Addiction and Underworld from Ireland to Colombia about the old Cartucho district of Bogota, Colombia. The old El Cartucho district of Bogotá, just blocks from the Presidential Palace, Congress, and Supreme Court, was controlled by gangs who sold drugs, murdered, and carried on operations with impunity. The area, about 10 square blocks, was inhabited by over 10,000 people, the vast majority of whom were street addicts and thieves. Santa Inés was originally an elegant neighborhood of republican mansions located a short walk from the administrative center of the country. Cartucho means “cartridge”, but it is also the name for the calla lily, which were common in the gardens of Santa Inés. In 1948 the assassination of Liberal presidential candidate Jorge Gaitán, who now graces the 1000 peso bill, sparked the historic Bogotazo riots. The wealthy families of Santa Inés relocated to the north of Bogotá to escape the violence. The assassination of Gaitán also marked the start of La Violencia, Colombia’s civil war between Conservatives and Liberals that rocked the countryside with indiscriminate killing and genocide. La Violencia began what would become a decades-long migration from the pueblos to Bogotá. Most of these internally displaced people, or desplazados, arrived at the central bus terminal located in the heart of Santa Inés. So just as the wealthy families were abandoning the neighborhood, desperate refugees came in floods to form a mosaic of Colombia’s regional cultures. The large homes deteriorated for lack of upkeep. Most were converted to boarding houses catering to alcoholics, drug users, and prostitution. In the 1980s drug traffickers increasingly bought up the large homes for crackhouses, cooking operations, and warehouses. El Cartucho became the primary wholesale drug market serving greater Bogotá. Cocaine and marijuana cost anywhere from three to six times more outside El Cartucho, so street dealers throughout the city either bought their inventories in El Cartucho or from middle-men distributors who bought there. Then the recycling industry was relocated to El Cartucho, and he combination of recycling and drugs attracted Bogotá’s thousands of vagrants. The streets were covered in trash, with groups of men and women lounging on the sidewalks smoking crack or inhaling glue. El Cartucho caused some public health experts to designate Bogotá as home to the worst and most violent drug addiction in the world. To this day, tourists to Bogotá will inevitably see its street addicts during any visit of more than a day or two. On a longer visit, he might see these addicts smoking crack, huffing glue, and even defecating on public streets far from the designated drug districts. 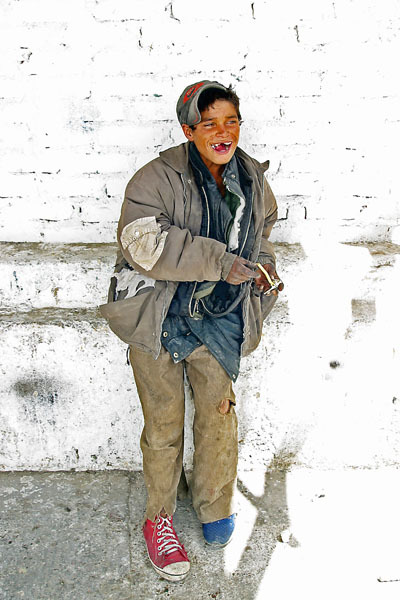 “Pegantosos” are street children who huff glue from paper bags or plastic bottles, which cost as little as 10 to 20 cents. Most earn their money as pickpockets and beggars. Glue merchants repackage a one-dollar bottle into smaller portions sold in recycled plastic bottles or paper bags, which are sold for ten to twenty cents. Other merchants in El Cartucho sold single servings of rubbing alcohol from makeshift bars. 25 cents bought a combination plate of rice with spaghetti noodles; it was also enough to buy a crack cigarette. El Cartucho was characterized by addicts, drug gangs, cardboard, crack, glue, and knives. Aside from drugs, cardboard was the major product of El Cartucho, followed by paper and glass bottles. In 1993 there were 30 recycling warehouses in the district, some of which rented out their wheeled wooden carts for their freelance employees to collect recyclables around the city and bring back. The problem in El Cartucho was compounded by stories of police in other Colombian cities, such as Barranquilla and Medellín, sending their local drug addicts on one-way buses to Bogotá. El Cartucho grew in size and became more violent, effectively creating a border between the north and south of the city where law-abiding citizens dare not go. At El Cartucho’s peak of infamy, a baby boy was found dead in the street, unnoticed for two days. Another boy, four years old, was raped and castrated. Several police were killed there, and on some occasions grenades were thrown by the mafia soldiers. When police were no longer willing to enter El Cartucho, they erected roadblock barricades and guarded the borders. Laws inside were dictated by the traffickers. While there are no statistics given homicide victims were internally disposed of, the murder rate in El Cartucho was higher than in Iraq or the former Yugoslavia during their respective wars. In enforcing the gangs’ street code, there were murders every day. The mafia soldiers were an integral part of life in El Cartucho as they maintained order in the kingdom of thieves and addicts. Stories abound of bodies being quartered with chainsaws and buried under the blocks of El Cartucho. Christopher entered El Cartucho a couple times – only in the morning – to buy marijuana. On his last visit, he was walking out next to a Colombian who was also on his way out. The stranger pulled a pistol from his jacket and fired a few shots behind him, without even looking toward where he was firing. Christopher felt obliged to give the stranger a smile of acknowledgement, and decided never to return. He could pay Chapinero’s higher prices for marijuana, which was still cheaper than beer. Christopher’s description of John Rowley the last time he saw him, ill-fitting rags and missing teeth, is the quintessential image of the Bogota addict who resided in El Cartucho, where Rowley was most likely killed. For those interested in Colombia, the work of Stanislas Guigui may be the most groundbreaking investigative journalism in a generation. The French artist spent over two years living in the Cartucho. The locals accepted him and his mission. His award-winning photography of the residents tells this important story. In 1998 Bogota mayor Enrique Peñalosa initiated the five-year process to demolish El Cartucho, which had grown to 23 hectares. 600 buildings were bulldozed and 12,000 people removed in one of Peñalosa’s biggest political battles. Public opinion was divided as residents wanted to keep their businesses and drug traffickers made open threats against police and public officials. The total cost to clear El Cartucho was 150 billion pesos ($70 million). Some money went to identify properties, compensate the owners, bulldoze the area, and build Tercer Milenio park on the site. Other funds financed social services for elderly and impoverished families living in El Cartucho, especially street children. Finally, a significant amount was spent on rehabilitation for drug addicts. In Colombian Spanish, cartucho has become a term for cardboard and other recyclables, as well as the open-air drug markets that sprouted up around Bogotá after El Cartucho was demolished. While the physical location for the drug addicts and their economy was eliminated, the people were not. So the new mini-Cartuchos with names like La L (pronounced La EL-ay) and El Bronx are now home to Guigui’s souls from hell. For more information on Bogota’s El Cartucho, visit madouttamehead.expat-chronicles.com/el-cartucho-bogota. As compelling as the embedded video above is, Stanislas Guigui had another trailer for the documentary that may have been better, but has been removed from YouTube. It featured one boy, no older than 13, smoking crack with his mother. And another boy, absolutely filthy and no older than 10, huffing glue. I am eagerly awaiting that film. Keep an eye on YouTube to see if he publishes that spot again. I believe this picture from Mr. Guigui won an award from UNICEF, but I could not find confirmation.